The Centre for Logistics and Supply Chain Management at LIBA was established in 2006. Since its inception the Centre has been promoting executive learning, research and consultancy in the field of Logistics and Supply Chain Management. The Centre provides an environment for facilitating fresh Logistics and Supply Chain Management practices based on new learnings and new knowledge acquired. The Centre for Logistics and Supply Chain Management at LIBA shall conduct programmes in handling of critical supply network issues among professionals in Manufacturing, Service and IT industries. The Centre designs and delivers the following focused Executive Learning Programmes for corporate executives, entrepreneurs and freshers. Familiarizing with adoption of technology and role of e-commerce for enabling efficient supply network. One-year Executive Diploma Programme in Supply Chain Analytics and Management. (MDC), for Executives of TVS Logistics Services. 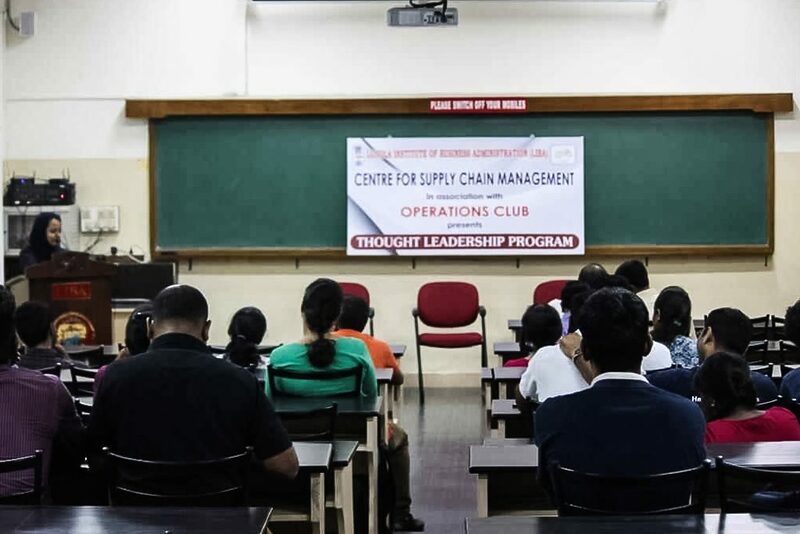 Thought Leadership Programme series provides an opportunity for professionals from Logistics and Supply Chain industry to share knowledge, skills and network. Experts and senior professionals share the best practices, current trends and new developments in Logistics and SCM. Dr.R.Arunachalam, Senior Vice President, ProConnect Supply Chain Solutions spoke on ‘GST and its Ramifications for Logistics Sector’. The Centre collaborated with the University of Bath, U.K and ALTIS, University of Catholica, Milan, Italy in an international research project on Ethical Supply Management. The Centre collaborated with ALTIS in a research project on waste recycling supply chain management. Scholarships are available for Ph.D. program (University of Madras) offered by LIBA for candidates wanting to pursue their full time research in area of Supply Chain Management. The Centre proposes to bring out a newsletter to share the best practices, knowledge and happenings in the field of Logistics and Supply Chain Management. Chandrasekaran, M. Ramasubramaniam., “Responsible Procurement in India: Some Perspectives”, Management Matters, Vol.1, Issue 13, 31-34, 2010. Chandrasekaran, M. Ramasubramaniam, “AligningSupply Chain of Sweet Corn Processor For Growth”, CASE Reference no. 615-047-1, The Case Centre, UK. 2015. Mathirajan, , Ravindra Gokhale, and M. Ramasubramaniam. “Modeling of Scheduling Batch Processor in Discrete Parts Manufacturing.” Supply Chain Strategies, Issues and Models. Springer London, 2014. 153-192. The Supply Chain Management Casebook: Comprehensive Coverage and Best Practices in SCM, Chuck Munson (ed. ), FT Press: Upper Saddle River, New Jersey, 2013, edited by Chuck Munson, Ph.D.
Batch Processing Machine with Multiple Incompatible Job Families, Non-identical Job dimensions, Non-identical Job sizes, Non-agreeable release times and due dates.” IOP Conference Series: Materials Science and Engineering. Vol. 46. No. 1. IOP Publishing, 2013. To organise public lectures, symposia, workshops and discussions on relevant topics of current importance. To encourage Ph.D aspirants to do research in the domain. To undertake publications-monographs, journal articles, books and case studies. To support research and case writing on issues relating to logistics and supply chain management. To facilitate dialogue between business leaders and academicians. To function as the Resource Centre on Logistics and Supply Chain Management.